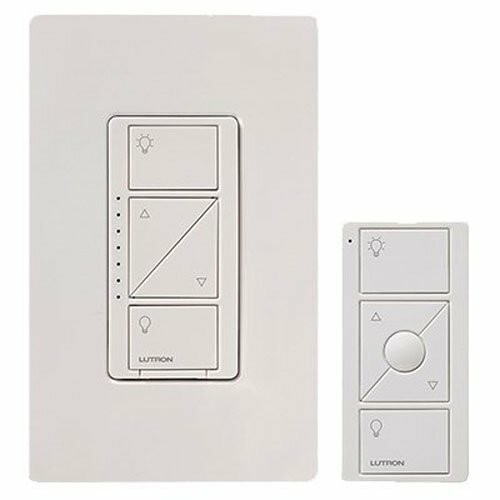 Lutron P-PKG1W-WH Caseta Wireless Multi-Location In-Wall Dimmer with Pico Remote Control Kit, White Meet the Caseta Wireless family! Controlling lights has never been easier, more reliable, or affordable with Caseta wireless dimmers and remotes. Offering the ultimate convenience and flexibility, the Caseta Wireless family allows you to adjust your lights and shades from anywhere in the room with Pico remotes or on the go using your smart phone or tablet with the Lutron app and Smart Bridge. Embedded with Lutron's powerful Clear Connect technology, the Caseta wireless family ensures a reliable, seamless and consistent connected home experience. Take light control to a whole new level with this convenient, energy-saving solution that installs in minutes. Once you make the switch to Caseta Wireless, you'll wonder how you ever lived without it. Control lights and shades from anywhere in the world - maybe you're on vacation and want to make your home look lived in, in your bed and forgot to turn off the downstairs lights, or in your driveway and don't want to enter a dark house. You can even schedule lights and shades to adjust automatically at set times of the day - sunset, sunrise, or when you know your kids will be coming home. Create personalized scenes to control multiple lights and shades at the touch of a button. Dim the lights and close the shades as the movie begins, or set an "entertaining" scene for when you have guests over. Add an additional point of control at the top of the stairs or next to your bed stand by attaching a Pico remote to your wall - no wiring required. Your connected home begins here - control your lights and shades from anywhere with the easy to use Lutron app and Smart Bridge. Embedded with Lutron's powerful and reliable Clear Connect technology, the Lutron Smart Bridge plugs right into your Wi-Fi router and provides convenient control of Caseta Wireless dimmers and Lutron Serena shades from iOS and Android-based smart phones and tablets. This starter kit includes an in-wall wireless dimmer, coordinating screw less wall plate and Pico remote control that lets you adjust lights from anywhere in the room. The dimmer simply replaces an existing switch, and works with the newest energy efficient bulbs, including dimmable LED and dimmable CFLs, as well as incandescent and halogen bulbs. Conveniently create just the right with this no-wiring required starter kit. The plug-in lamp dimmer simply plugs into a standard outlet, can be used with up to two lamps, and works with dimmable LEDs and CFLs, as well as incandescent or halogen bulbs. The kit also includes a Pico remote control to conveniently turn lights on/off as well as brighten or dim them. Add additional in-wall and plug-in dimmers to your home by purchasing Caseta Wireless stand-alone dimmers. Compatible with dimmable LEDs and CFLs, as well as halogen and incandescent bulbs, these wireless dimmers give you the ability to set the right light for any activity. You can conveniently control several Caseta wireless dimmers with a single Pico remote control (sold separately) or purchase additional Pico remotes for independent control of each dimmer. This handy wireless remote controls Caseta in-wall or plug in dimmers, and boasts a 10-year battery life. You can turn lights on, off, raise or lower them from anywhere in the room as well as set and save your preferred light level with a "favorite" button. The Pico can replace an existing 3-way switch when paired with a Caseta Wireless dimmer, as well as attach anywhere on a wall with a screw less wall plate to add an additional point of control. Available in a variety of versions and colors, you can also use the Pico as a handheld remote, mount it on a tabletop pedestal or attach to a car visor clip. Coordinate your Caseta Wireless lighting controls with accessories that add versatility and complement your decor - ensure you never misplace your Pico remote by pairing it with a tabletop pedestal. Turn on your lights from the safety of your car as you arrive home with the Pico Car Clip. Attach your Pico remote to the wall for an additional point of control with a coordinating wall plate. Caseta Wireless accessories are available in a variety of colors, allowing you to beautifully customize the look of each room in your home.